I didn't have the pleasure of reading Firefly Lane before I went into this book, so everyone I met, and every scene remembered within Fly Away, were first impressions, and new experiences, for me. I want to tell you that this book completely broke me, because it did, but unfortunately, it happened only at the last 15-20 pages. 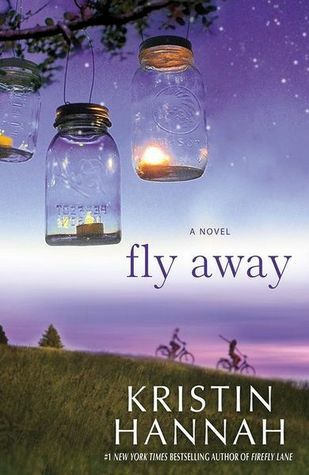 More than 3/4 of Fly Away was comprised of excruciating repetition, and horrendous cliches. Fly Away is told in alternating point of views, and timelines. It was slightly unnerving, and a little confusing at first, but I was able to pick up on the pacing after a couple of chapters. Kate Ryan has recently passed away, another victim of cancer's unrelenting grip. Her death rips a massive void in the hearts of those who were blessed enough to love her, including her family: husband John, and children Lucas, Wills and Marah, and lifelong best friend, Tully Hart. The book touches on each person's grieving process, but it mainly explores the life, and past, of Tully. Kate was every good thing in Tully's life, her anchor to a world that was unfair at every turn. Tully's promise to Kate, to be there for Kate's family, especially her Goddaughter Marah, becomes a monstrous effort, as everyone begins to fall apart in ways they never would have imagined. I don't want to make light, nor poke fault, at the controversial subjects that arose in Fly Away. I have yet to experience the indescribable pain that accompanies grief, so I am in no position to say what does, and doesn't sound like a consequence of that pain. However, the sequence of events in Fly Away just seemed SO far-fetched to me. The night of his wife's funeral, Johnny decides to whisk his children away on Hawaiian vacation, to hope cope with their loss. While there, his daughter, Marah, is inconsolable, and in my opinion, a little too overly dramatic-and NOT in terms of grieving, it was her attitude, in general, that frustrated me. She then goes on to become an out-of-control cliche: all running away, and goth, and inappropriate boyfriend. She was a whiny, ungrateful, little BRAT, and I couldn't stand reading her chapters. I just wanted to slap some good sense into her. In addition to that character qualm, Fly Away was overall, a very exhausting feat-it could have easily of been about 150 pages shorter. Instead, I wish Kristen Hannah had used those pages to step away from the process of grieving, and focus more on the character's back stories-I would have LOVED more of Dorothy's life. Those last 20 pages that focused on her, was EASILY the best part of the book. I found it hard to sympathize with any one else, though to say that the writing was to blame is both true, and not so. Hannah wrote with a heavy heart, and a generous hand: her words were easy to follow, but sometimes there was just too many of them. If you're planning on picking up Fly Away, be prepared to devote some serious sit-down time with it. The story line was sub-par, but the writing made up for it, when it could. Recommended for fans of: Barbara Delinsky, Elin Hilderbrand, Women's Fiction, Contemporary, Controversial Issues.